* Estimated delivery time by USPS and not guaranteed. In some instances, actual delivery may take more than 2 weeks. If your order is time sensitive, avoid "First-Class Mail " or "Priority Mail Intenational", as our local US Postal Office will not accept inquiries until 30 days after shipments. **Fee will be advised for authorization before shipment. Or contact us at yachtsurvey_publishing@cox.net if you like to know actual cost before placing your order. Please Click Your Country Group Number for Fee Schedule. 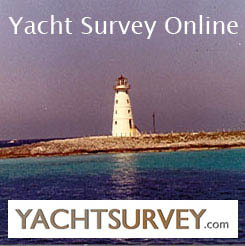 If you do not see your country, please email us at yachtsurvey_publishing@cox.net for the infomation. Fee Schedule: Last updated January 15, 2015, Country Listing: Last updated January 15, 2014. Page last updated December 25, 2018. Normally book orders ship within 24 hours during business days. Last updated December 25, 2018.